Database Conversion for Excel converts Excel XLS files to database formats for use in other database software, word processing tools, or for posting online. Database Conversion for Excel can convert to over 10 file types including DBF (Dbase III/IV, Visual FoxPro), PRG (Clipper/Foxpro), TXT, HTML, XML, CSV, SQL, and RTF. The program is useful for database administrators who deal with databases in various formats and want to save money on expensive database creation tools. 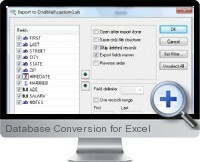 Database Conversion for Excel uses a wizard driven interface that makes Excel file conversion quick and easy. Conversion from the command line is also supported. The user starts by selecting the source file then chooses the desired output format and destination to save the new file. The next step is to preview the source and edit columns such as name, size and column type (if necessary). Database Conversion for Excel also allows filtering and sorting data by any column. To avoid duplicates in the output database, the program provides a special option. If enabled, the tool automatically identifies duplicate entries and erases them, so that the output is clean. Database Conversion for Excel can easily handle large databases or even several files in one process. Database Conversion for Excel relies on the super fast algorithm that has been optimized for fast processing to convert to a new database format.